San Marcos la Laguna is a small Mayan village on Lake Atitlán in the western highlands of Guatemala. It has become a Mecca for international travelers attracted by its beauty, tranquility and diverse options for spiritual exploration and therapy. Terraced into the side of a cliff, The Yoga Forest is a twenty five minute hike up into the valley from Lake Atitlán, To escape to our lush tropical food forest please travel to us with a backpack, organic soaps, a head torch and a spirit of adventure. If your looking for privacy, the Forest Cabins are perfect for you. 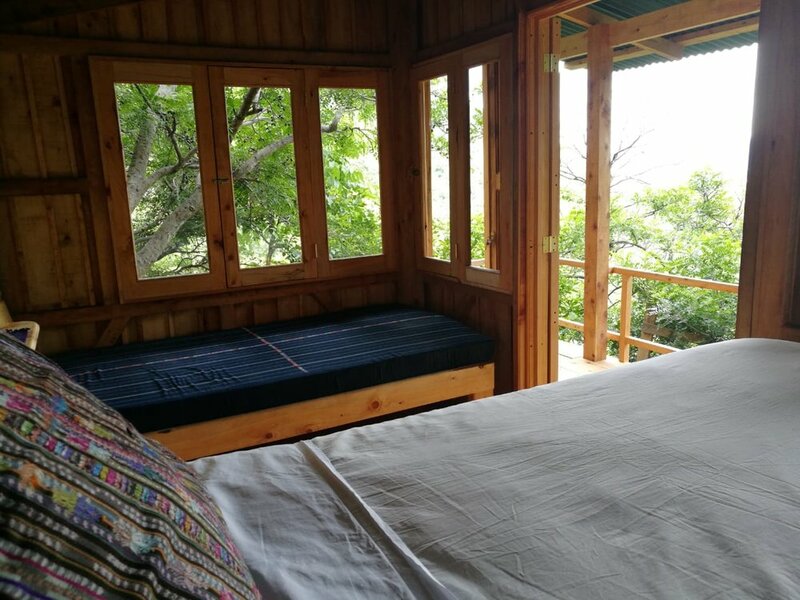 With amazing lake and forest views, these cabins feature small terrace to relax and enjoy the view and accommodate two people with a queen and single bed inside, perfect for couples or friends to share. Located above our cafe and office, the Ganesh Loft is built into the cliff wall. Made with bamboo, cypress and a palma roof, the Ganesh Loft looks out over The Yoga Forest to the lake and volcanoes. The Ganesh loft has a low to the ground queen size bed, antique Guatemalan furniture, Mayan fabrics and Indian textiles. The Ganesh Loft is only available at certain times of the year. ** Please note ** Occasionally during high season and double hosting retreats, we may need to use the deck for 1.5 hours throughout the day to host some of our yoga classes. 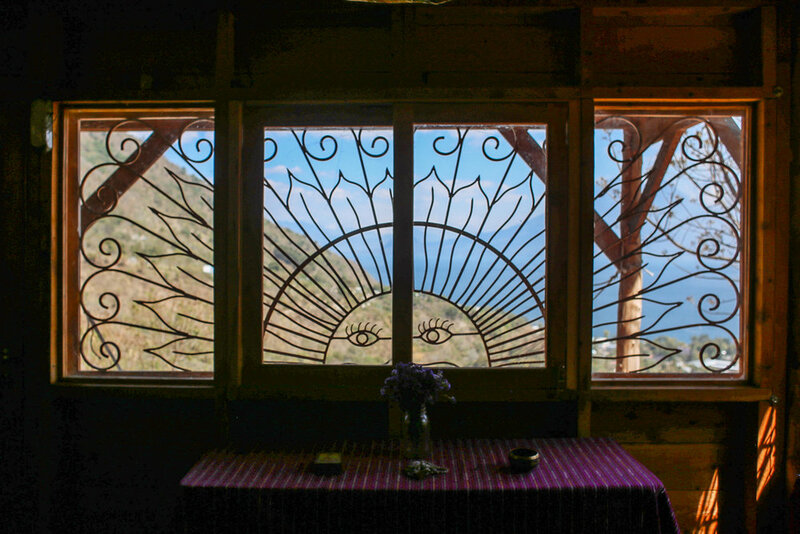 A unique private space, the Shiva Yogi Loft is an open aired bamboo loft in our beautiful Shiva Temple, next to waterfall and cliffs. It is tucked up into the palm roof of this 10m high temple, creating a semi-private space with a queen size bed for one or two people (as there may be classes going on down below). Most suitable for yogis, as meditation often begins downstairs at 6.15am (some days it will be in the other Shala), and the Temple may be used for personal practice or various workshops during the day. 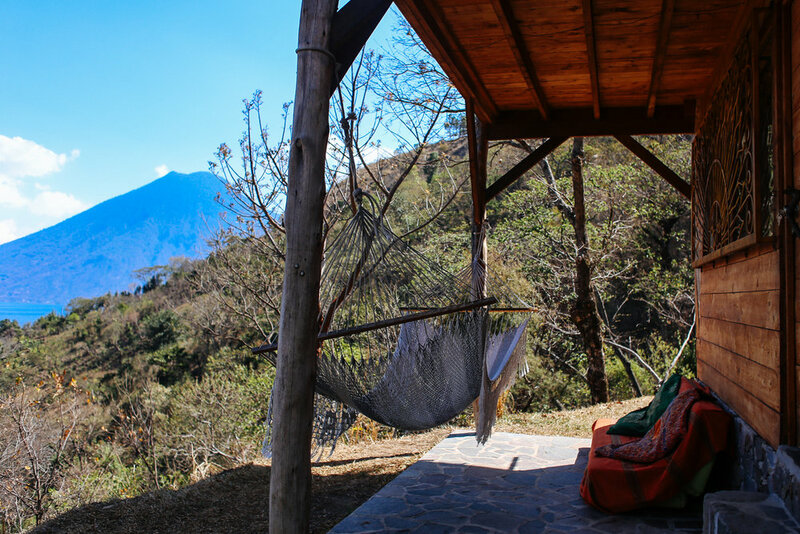 Looking out over Lake Atitlán and its surrounding volcanoes, our shared cabañas accommodate four people,in large single beds. 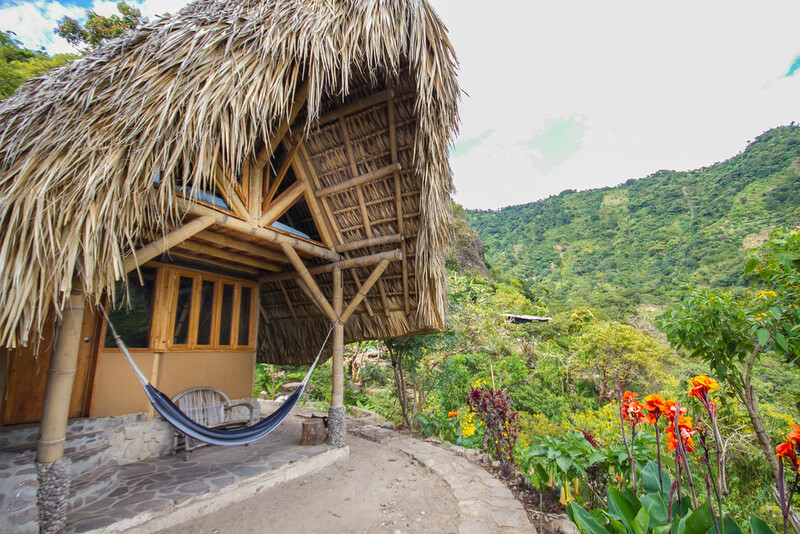 Using natural building techniques, our cabañas are constructed with either bamboo or cypress, palm roof and natural adobe walls or traditional bahareque (wattle and daub) of this area. 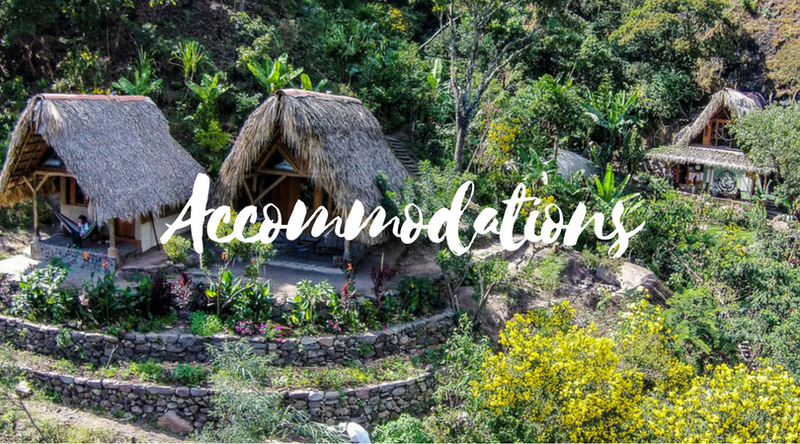 The beds are comfortable, with warm feather duvets and pillows, and decorated with Peruvian Shipibo fabrics and Guatemalan Cushions. 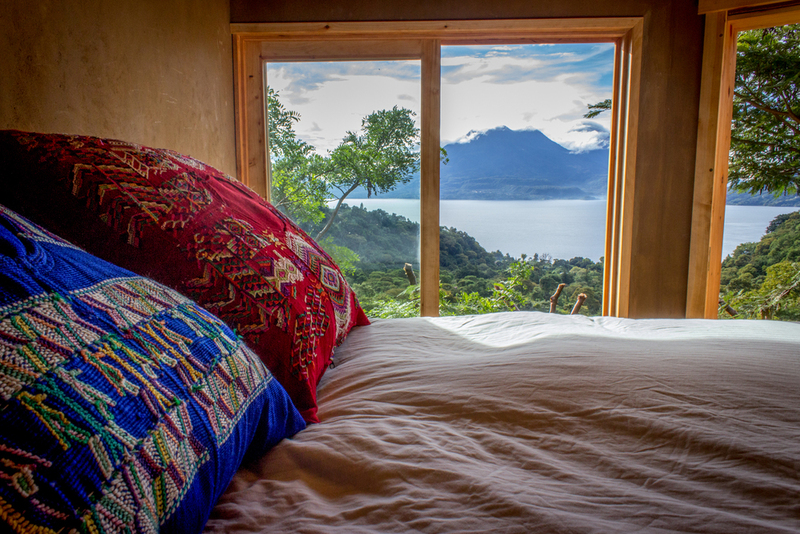 With wonderful views of Lake Atitlán and the surrounding volcanoes, private rooms Radha & Krishna are located under our Shakti Shala and accommodate one or two people in a queen size bed. The beds are comfortable with warm feather duvets and pillows, and decorated with Guatemalan cushions. Most suitable for yogis, as meditation often begins upstairs at 6.15am (some days it will be in the other Temple space), and the Shala above may be used for personal practice or various workshops during the day. 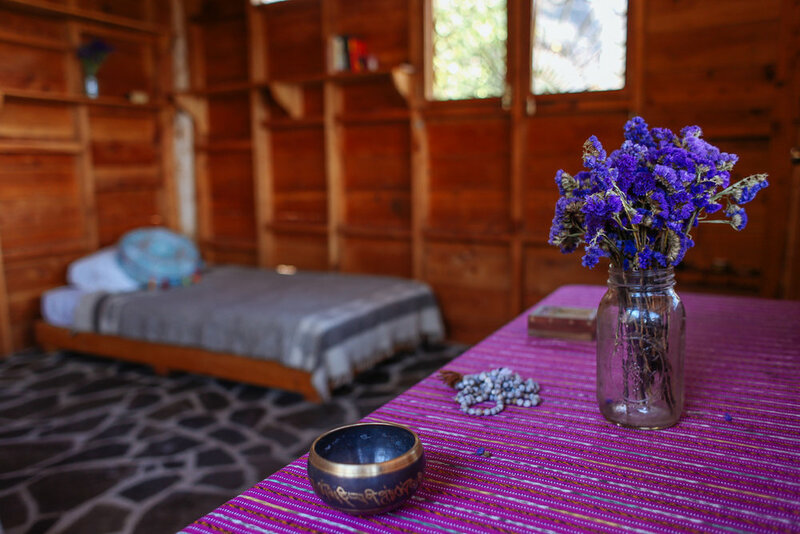 Lakshmi Wellness is a space often used for massage treatments when unoccupied, with magical views of Lake Atitlán, the Lakshmi cabaña is the highest accommodation on the property made of cypress wood from sustainable Guatemalan plantations. This private space has a queen and single bed inside, and a comfortable terrace with sofa bed and hammock. Prefer to stay in your own tent? You can bring your own and enjoy your own private terrace, be sure to bring a warm sleeping bag and good sleeping pad for comfort! Sign up with your email address to receive news and updates about The Yoga Forest.